As you may already know, traditional marketing has its limitations and in a sea of “me-too” competitors, it is the brand that thinks outside of the box that gains the most attention. Each year when the opportunity comes around to put together a new marketing plan, business owners and/or marketers are left scratching their heads, wondering what is they can do beyond just maintaining their website and other forms of traditional marketing? Forward-thinking marketers are now starting to implement more bleeding edge technology into the marketing. 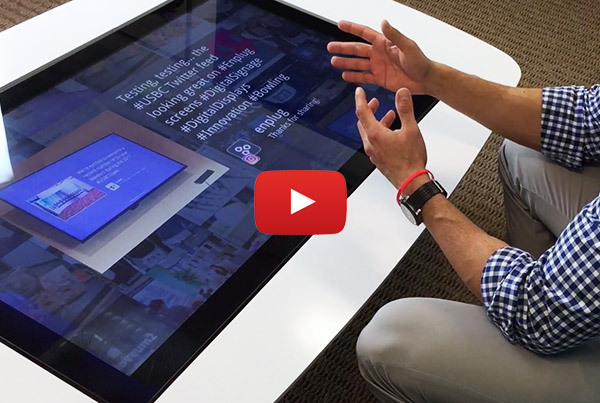 We aren’t just talking technology updates in the form of web features or marketing automation, but rather fully immersive user-driven technology like large format touch screens and touch screen tables. In a recent study by MHI Research Institute, most B2B companies complain that their number one pain point is the inability of their sales team to communicate their value story. Interactive digital signage and touch screen technology allow brands to create a lasting impression with prospects through interactive storytelling. User-driven, hands-on tactile learning is statistically superior to any other form of learning and comprehension. By integrating technology like touch screen tables and interactive software, you are putting your guests and/or prospects in the driver’s seat of their own content-rich experience. Brands willing to thinking outside of the box of traditional digital marketing by leveraging touch technology and interactive storytelling solutions will be the brands that resonate most with their audience and create the most mind share. Interested in learning how your company can incorporate interactive technology into it’s marketing efforts?